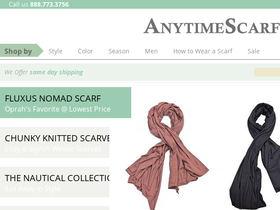 Shop at Anytime Scarf, online at AnytimeScarf.com, and enjoy great scarves at any occasion. Anytime Scarf believes that the right scarf will transform any outfit, and they offer a great selection of scarves to suit outfits worn during winter, spring, summer, and fall. AnytimeScarf.com features shawls, fashion scarves, plaid, woven, floral and lace scarves, scarves for men and women, and designer scarves from brands like TDM Design, Bindya Collection, Fluxus, Saks Fifth Ave, Yarnz, and more. Additionally, AnytimeScarf.com offers all these great accessories at affordable prices. So before you decorate and re-decorate with a wide selection of beautiful scarves, be sure to save with the latest AnytimeScarf.com discounts, Anytime Scarf promotions, and Anytime Scarf coupon codes, found here at RetailSteal.com. For orders shipped in the U.S., AnytimeScarf.com offers free shipping on orders over $50 via USPS First-Class Domestic Mail. Any Scarf also ships internationally. Consult site for international shipping charges. Take 10% off your order at Anytime Scarf with this coupon code. Shop today and save on scarves from TDM Design, Yarnz, and more. Click here. Use this coupon code on Anytime Scarf to save $10 on your entire order. Use code on orders of $100+ to qualify. Shop the sale section at AnytimeScraf.com and save up to 70% on a great selection of scarves. Click here to save on pashmina, beach wraps, cashmere, and tons of other styles. Spend $50 or more at AnytimeScarf.com and your order is shipped for free. Click here to save on scarves from brands like Fluxus, Saks Fifth Ave, and more. Save up to 60% or more on pashmina scarves and wraps at AnytimeScarf.com. Shop today and save on great styles. Save up to 50% on select winter scarves at Anytime Scarf. Click here to enjoy. Shop for men's scarves from as low as $20 at Anytime Scarf. Click here to shop! Go to AnytimeScarf.com for this season's scarves, starting as low as $12. Click here to go there now. Shop online at scarves.com and save 30% off on all non-sale items. Use this promo code at checkout to save. Check out Scarves.com and save 15% on select items for Back to School. Click here to shop and use coupon code. Shop at Scarves.com and find scarves starting at just $9.80 in the sale. Click here to shop. Shop at Scarves.com and enjoy 12% savings on all orders. Click here for code. Check out Scarves.com and pay only $2.99 for shipping on every purchase. Click link now.